Coaching has always come natural to Lee, and it is what he enjoys most about his career: Helping people learn. Lee speaks all over the world teaching coaches and fitness professionals. He is regarded as one of the top instructors of multi-directional speed training in the sports performance profession. Lee is not only a creator of athletic movement concepts , but he is also one of the leading teachers of athletic movement. For these reasons, Lee is consistently asked to perform workshops and clinics for schools and organizations all over the world. A coach of coaches, Lee teaches more than just his techniques, he shares his art of coaching with others. Although he enjoys instructing adults, Lee thrives on working with youth. You can choose from combines, speed camps, and sport specific camps for your young athletes. These events can even be turned into fund-raising events for your organization. Lee is frequently asked to teach his multi-directional speed training techniques and methods and multi-directional programming . He is often hired by college strength & conditioning departments, secondary schools, sports performance businesses, travel and club teams, professional organizations, youth organizations and fitness clubs. The tabs below show a highlight of the ways Lee can help you and your organization. This option is available for local or distant presentations and can be scheduled for 4-5 hours in length per day. Additional days can be added. With Lee’s highly dynamic Full Day Workshop, you won’t be sitting in a chair all day listening to someone speak. Lee will involve you in a learning based approach on a practical, lecture and open discussion format. Lee’s workshops are set up to give you as much learning and experience as possible. You will walk away having an energized approach to training and gain the practical knowledge to make it happen. How to implement Lee’s powerful Medicine Ball Fake Throw Program. Proper jumping and landing training. Using Tag and speed games to create competitive speed atmosphere to instantly assess efficient movement. Strength training program and lifting technique workshop is upon request. Other areas of speed development can be included upon request. “Lee Taft is my go-to guy when it comes to multi-directional and true “sports speed” development. Other guys can build get track athletes, but I’m not sure there’s anyone better than Lee when it comes to teaching how to be fast on the court or field. The best part about Lee is that he’s developed a true system. This isn’t one-size-fits-all – it’s a system that includes progressions and regressions to make sure each and every athlete is getting the best possible result. Experiencing this small group setting is unlike any seminar or clinic out there! Spend three days as a guest in Lee’s home immersed in sharing ideas, learning from one another, and discovering what our eyes see during speed assessment modules. Only 7 are invited to attend each retreat. This helps maintain the small, intimate group setting. Lectures will include power point presentations, along with video analysis and breakdown. Instructional practice to polish in your teaching skills, cuing, and assessment ability. Participate in multiple warm up routines, active walk-talks, and sprint mechanic sessions. Earn a certificate as a Multi-Directional Speed Instructor (MDS-I). Receive a binder with detailed information of everything we cover over the retreat. Receive a gift bag with awesome surprises! All meals will be served at our home, as well as snacks and smoothies. Throughout the three days, you will be coached and required to participate in all multi-directional speed patterns and sprint mechanics. Patterns such as linear and lateral acceleration and deceleration, change of direction mechanics, retreating patterns and mechanics, jumping and landing variations and sequences, max velocity mechanics, and posture work. You will also be coached and required to participate in various strength patterns in order to have a complete understanding of movement efficiency. Every morning and afternoon you will participate in 20-minute routines designed to educate, but also prepare your body and mind for a long day of learning and activity. We will perform various mobility, core, stability, activation, and low-level strength. Lee will line up professionals to speak to for 45-60 minutes sessions. You will earn a certificate as a Multi-Directional Speed Instructor (MSD-I). This certifies that you have participated in the Lee Taft 3-Day Speed and Performance Retreat. Please contact lee@leetaft.com for dates, additional details, retreat fee. 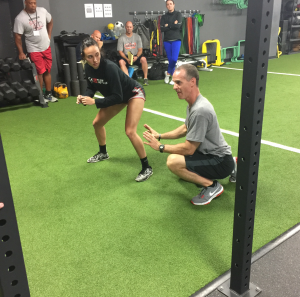 The Jump Start Speed Clinics are created and designed using Lee’s years of teaching experience and proven systems for multi-directional speed training. Since the early 90’s, he has directed hundreds of camps and clinics. Through these experiences, Lee has discovered the pros and cons of the various styles and systems. He made notes of what coaches and athletes wanted and needed. Less fluff and more substance. The Jump Start Speed Clinic for Athletes is for athletes in grade 6-12 and any sport. Clinics are 2 hours long. A minimum number of athletes are required. Why will Athletes Benefit from the Jump Start Speed Clinic? Athletes will be instructed, not only the “How”, but also the “Why”. Athletes will walk away with empowerment. The skills athletes will learn sharpen their cutting and change of direction regard less of their sport or position. Each athlete will discover that acceleration, in any direction, is a product of body position and where to push. It is amazing to see the “light bulbs” go on after learning the techniques. The exact same techniques that will increase their change of direction ability will drastically reduce the potential for silly ankle sprains and knee injuries. When the athletes understand how “reacting” from the proper posture and stance set up will allow them to explode out of their stance so much faster, then they will be sold on doing things the right way. The Jump Start Speed Clinic for Coaches is for any sport or performance coach. Clinics are 2 hours long. Workshop is designed to breakdown the important components of teaching speed. Know more drills is cool, but knowing why, when, and how to implement the correct drill for the skill is key. Discover how simple, yet effective cues are. Cues get the job done better than spending five minutes on a long-drawn-out explanation. Cues are killer! Learn how to select appropriate exercises during the in-season to peak speed and quickness without inducing unwanted fatigue. How to program speed and agility right from the warm up prep-phase to anytime throughout your practice. How to put together a program that focuses on reactive speed training and corrective speed training. How to develop a template to quickly and easily create daily training programs. A system of what to look for when assessing multi-directional speed movement and max velocity sprinting. How to program a daily, weekly, and multiple week program. How to use the Reactive Tier System for Speed to maximize athlete’s potential. How to use external cuing techniques to help athletes learn and “feel” movements. Simple assessment to identify movement landmarks during speed skills. Coaches will get the benefit of helping during the athletes Jump Start Speed Clinic to gain firsthand experience and learn from the lead coach and assistance. To request more information or to schedule a consultation with Lee about your organization or event, please fill out the form below.